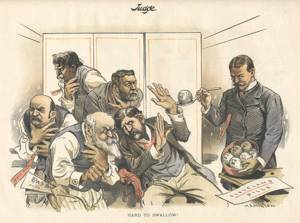 This cartoon reveals how distasteful the nomination of Grover Cleveland was to some key Democrats. On the right, campaign manager William C. Whitney administers “Cleveland Pills” to party leaders who are having difficulty digesting the capsules (which are oversized in mockery of the candidate’s weight). The reluctant group is (clockwise from the top): Henry Watterson, editor of the Louisville Courier-Journal, who opposed Cleveland’s renomination in 1892; Richard Croker, head of the Tammany Hall political machine of New York City, which had stridently opposed Cleveland for years; Senator Calvin Brice of Ohio, former chairman of the Democratic National Committee, whose lethargy during the 1888 campaign helped seal the doom of Cleveland’s failed reelection bid; Charles Dana, editor of the New York Sun, who had backed Senator David B. Hill of New York for the 1892 nomination; and, Hill himself, who was a longtime political rival of Cleveland’s.